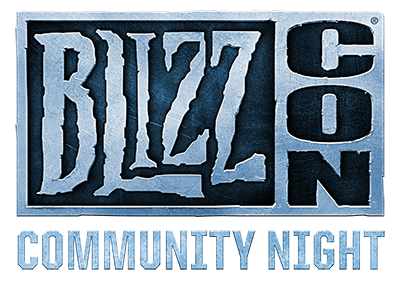 Community Night returns for BlizzCon 2018. For one incredible evening, you the players take center stage in a celebration of everything that makes you the greatest gaming community of all time: your unrivaled passion, your brilliant talents, and your amazing craftsmanship. Let our hosts infect you with their energy as they guide you through a series of contests where you can show off your skills and your charms (and win sweet, sweet prizes). Check out what's in store! Prepare your pens, paints, pencils, and tablets: the BlizzCon Original Art contest returns for 2018! Submit your wholly original work of art based on Warcraft, StarCraft, Diablo, Heroes of the Storm, Hearthstone, or Overwatch, and you'll be entered in a global contest for a chance to win great prizes and have your artwork showcased at BlizzCon 2018. Calling all directors, cinematography geeks, editors, and movie lovers: the BlizzCon 2018 Movie Contest is here! After telling stories for over 25 years, it’s time for you to tell us one of your own—on the silver screen! To enter, all you have to do is create an original movie (up to 3 minutes in length) based on Blizzard’s game universes using live action, animation, in-game footage, or a mix. Winners will be announced and showcased live on stage at BlizzCon to a massive audience. Your moment in the limelight awaits. The BlizzCon Talent Contest is back in action, and we can’t wait to watch you act, sing, dance, and strut your stuff on camera! To sign up, you’ll need to create a 2-minute video of you and up to 4 of your friends (5 total) performing your act. Please refrain from doing a lot of post-production work or adding camera-angle shifts—we want to see your act as it would be performed on stage! The Costume Contest returns in a brand-new, better than ever format, and we just can’t wait to see what sort of fantastic creations you’ll take to center stage this year! As always, the number of contestants will be limited, and your creation must meet all requirements to be eligible for one of the 25 spots in this most prestigious of cosplay competitions. But fear not, there will be plenty of other chances for you to strut your stuff at BlizzCon! We know a lot of people enjoy seeing everyone’s costuming creativity on display — and that’s why in we’re planning to add a separate cosplay exhibition taking place the afternoon before Community Night. While the cosplay contest will showcase the top 25, this exhibition will give more people an opportunity to show off their work (including a mix of top-25 finalists and awesome costumes that didn’t quite make the final contest cut) and walk one of the stages at BlizzCon. Registration to participate will also be required; stay tuned for more details on our plans.